Happy 25th day of the month everyone. As it turns out, this is the first 25th day of the month since I acquired an out-of-production model with the Lange date display. It is also my first Lange piece with white-on-black date discs. Whether black-on-white or white-on-black (or even other less common color combinations), seeing the big "25" numbers on the dial still give me reason to pause and smile all these years later. I suspect that is the case for many of you. Whether you were a WIS or WIS-in-the-making back in the day when ALS was relaunched and the number 25 became the initial date numerals associated with the modern manufactory, or if your exposure to the brand occurred later on via the Lange catalog in print or perhaps even on-line, it is hard to ignore the foundational role that "25" has played in the Lange date-related iconography. And since it has been years since I have enjoyed seeing 25 on my wrist, happy 25th to all! I will admit that this particular model isn't one that has always stood out for me as home run watch within the Lange 1 family catalog. Sure, I have appreciated that it is platinum-cased. And I recognize the relative rarity of the white-on-black date display. I also get that the Stealth rhodie dial platinum model has been continuously produced since 1995 and thus is a little more common than the Darth among regular production platinum models. Nonetheless, I long thought of the Darth as a nice watch but not a must have watch. Recently, and in part due to the TZ library of posts discussing this model, I have come to revisit and consider this particular Lange 1 iteration with fresh eyes. What I have learned (through too much looking and reading and contemplating than I would like to admit to) is that I think the Darth color map provides a superb color "canvas" if you will, to appreciate the beauty and genius of the Lange 1 dial design. I think we all know and respect the incredible Lange 1 dial layout that was a stunning development back in 1994 and remains a cornerstone of the ALS design language today. In Darth form, the watch is basically composed of two colors. Black dial and silver/white color case, hands, applied markers and dial printings. With consistent date disc backgrounds and dial color, there is really sound integration along the vertical axis from date aperture down through the power reserve hand and ultimately to the seconds sub dial. I suppose that Lange 1 models with very light silver or white dials with black dial printing and black-on-white date discs can replicate the Darth in this respect, albeit in inverse relationship. However, these models have a different kind of color palette contrast between the case metal and the dial, so the Darth is somewhat unique. I have also come to appreciate the merit of having the minute/hour sub dial on the left and the date/PR/seconds sub dial on the right. I think many right-handed individuals have wondered if it would have been strategically superior from a design perspective to place the hour/minute sub dial on the right side, so that when half of the watch was peaking out from under a shirt cuff, the time was visible when the watch was worn on the left wrist. 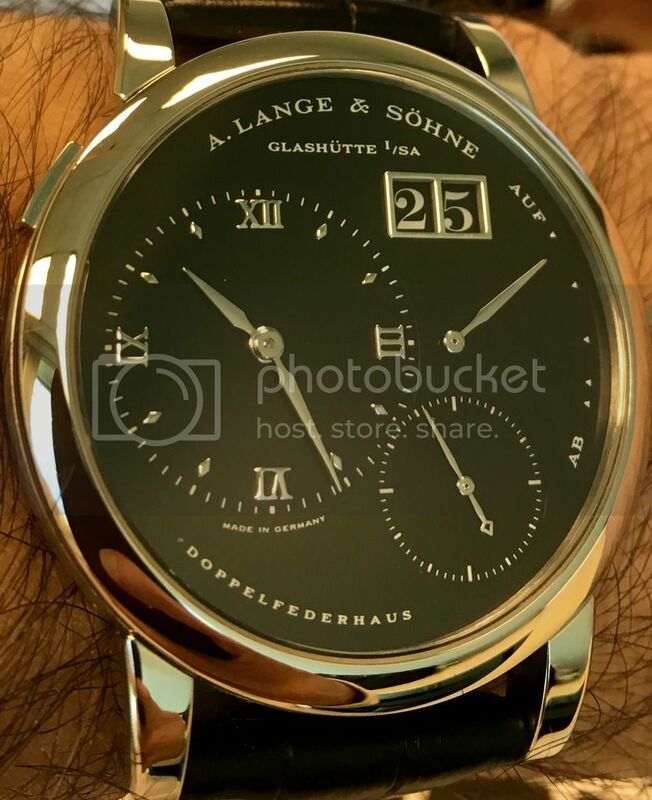 While it is true that the time portion of the watch would have been perhaps more easily read, there was sound reason to follow the Lange 1 design that we now all know and feel comfortable with. With some select exceptions, we read from left to right. The Lange 1 was designed to be read from left to right as well. Time first. Then, in secondary positions, one finds the indicators with secondary importance. Date, PR and seconds. Ok, now for my final point and one that is pertinent to all Lange 1 versions. The non-overlapping dials and hands are just fantastic. One thing that I have really been enjoying is the geometric patterns that are provided by the hands as they move around the dial. Sometimes they are parallel, sometimes at right angles, sometimes scattered in less formal geometric alignment. The spatial representation of time is such a wonderful concept. I think I will conclude here and apologize if I have rambled on too long or in too much detail on these matters! Happy 25th to all who appreciate the brand in general, and the Lange 1 in all of its wonderful versions.